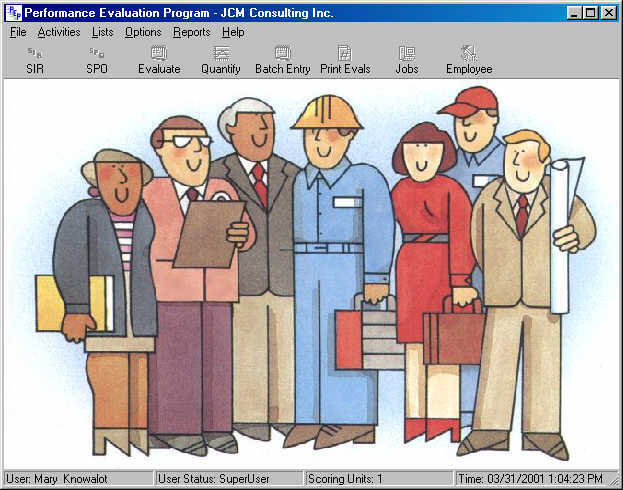 Developed by JCM Consulting, Inc.
We have made it easy to do evaluations right! The most objective and comprehensive evaluation program available! 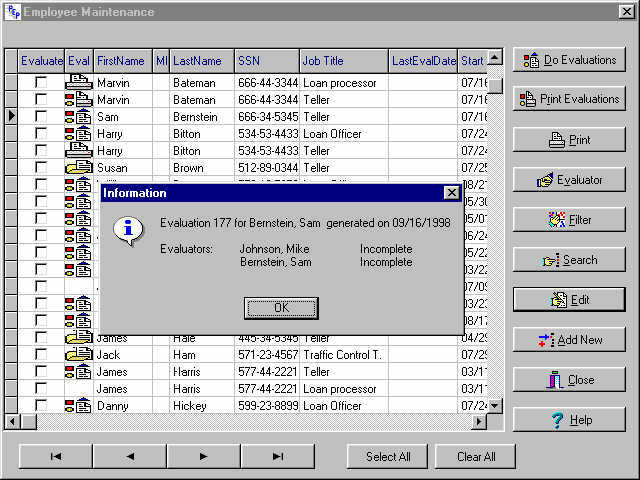 All quantity data, goal status, and incidents that occurred during an evaluation period are displayed on your computer screen at evaluation time. We have implemented an innovative method to demonstrate our product via the Internet. Adobe, Acrobat, and the Acrobat logo are trademarks of Adobe Systems Incorporated. PEP for Windows, is innovative, comprehensive, and the most objective method of employee appraisal available. This evaluation program is designed to be flexible, meaning it applies to virtually every organization and job description. PEP is user- friendly, unique, and flexible, given its ability to implement libraries of job performance factors, weights, and standards. The program is the only product that can use computer network entry or template forms. Of significant importance is PEP's ease of conducting an employee performance evaluation. The evaluation is tied to a blue print designed for positively motivating the employee, thus increasing the employee's productivity. Our clients are attracted to PEP because it is a more objective, faster solution for the often laborious employee evaluation process. No other method can match our objectivity and comprehensiveness at any price. Organizations are motivated to buy our products because of direct cost/benefit analysis. Replacing valued employees, or hiring the wrong employees, are both costly and time consuming - costs our services have proven to reduce. JCM has an established history of increasing organizations' performance. Employee performance evaluations have too often represented a waste of time and extra work for managers without establishing any positive results. 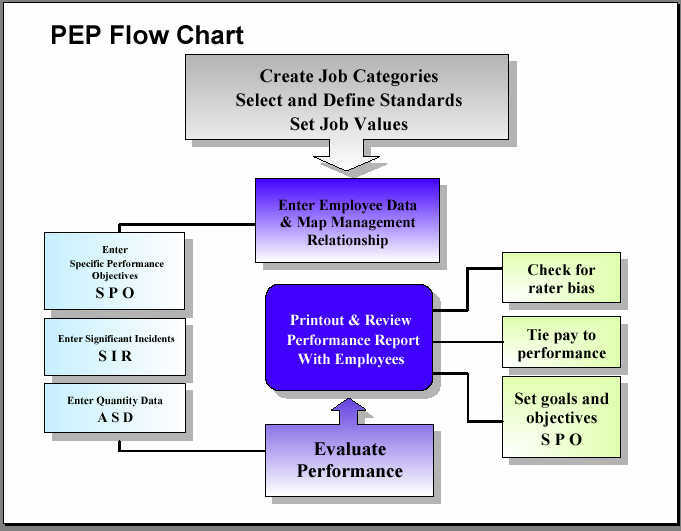 The Performance Evaluation Program (PEP) is a comprehensive computer-aided evaluation system, adaptable to both large and small companies. With this easy to use program, the supervisor can quickly and objectively evaluate employee job performance. The unique paradigm of tying all performance features (objectives, incidents, and quantity data) to performance factors/competencies makes PEP the most objective appraisal system available. The PEP program is specifically designed to be flexible, meaning it applies to virtually every job description and organization. This flexibility even allows an importance weighting on up to 24 individual job factors per job. The weighting is done on the computer with the aid of employees and supervisors who know the job. It is very important to see a graphic example while setting the relative weighting. The program automatically converts the job values to percentage making the process simple and easy to understand. The values graph, along with the job standards, are always available to the employees either on-line or as a printout. Employees always know the value of factors comprising their job and will have a blueprint for excellence. We describe our performance appraisal system as a modified BARS (Behaviorally Anchored Rating Scales) system. As you are probably aware, BARS is considered the most defensible appraisal method in the case of legal actions. A unique feature in our program is the ability to use quantitative data from any source and compare it to pre-established job standards. While this may sound complicated, our program accomplishes this with very little effort. PEP was first introduced in 1986 as a DOS product. This is not a version or a relative of the subjective essay performance evaluation systems you may have noticed on the market. No matter how cute, easy, or intuitive an essay evaluation appears, it is still the most subjective method of employee appraisal. If you have used or tested any of the computer based products, you are probably aware of statements about essay versus BARS in which they admit BARS is the most objective but theirs is easy. They underline that it may be much more work to put a BARS program in place and that is where PEP comes in. 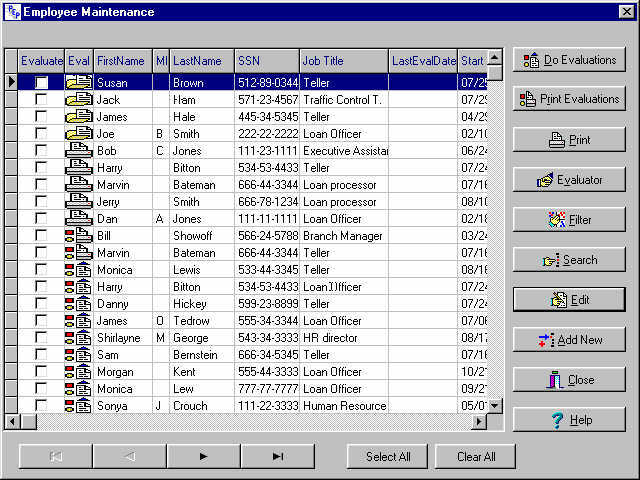 The PEP program will allow you to state both quantitative and written descriptions for each level of job performance. PEP weighting and standards are better determined with the aid of employee involvement. The program allows you to compare actual performance against your predetermined standards. Many companies are using these printed performance standards to inform present as well as new employees of job-specific performance expectations. The program allows employee and evaluator input at a network computer. Employees evaluate themselves and their own efficiency in each category of job factors. All performance areas are on the screen. If any quantity data was entered during the evaluation period the QTY DATA button will light up. The Employee and the evaluator will have the option of accepting the computed data comparison to the job standards. This will allow 41 levels of performance with complete objectivity. The SIR button will be lit if any Significant Incident, good or bad, was recorded during the evaluation period. The SPO button will be lit to review past Specific Performance Objectives. The ADD NEW SPO allows the evaluator to initiate new goals related to each specific performance factor at evaluation time. The evaluation process also allows the employee to identify any basic needs that are not being met in their work environment. The evaluator has the opportunity to enter in comments throughout the evaluation process. If the employee or evaluator does not have access to a computer, the new PEP program will print a custom set of factors on a special template form that is inserted in your printer at evaluation release time. The completed evaluation data is then quickly entered into the program. A summary report is then generated and to be used for management-employee discussions. Lines of communication are opened as areas of mutual improvement and strength are listed and discussed objectively. Differences of opinions, a blueprint for improvement, areas of strengths and environmental needs are all shown in an easily understood manner. Management also receives a two-part report of scores and evaluation ratings, which greatly assist in the further development of managerial skills. PEP The first computer aided Performance Evaluation Program! The DOS version of PEP was a computer-aided program first released in 1986 and the first program on the market to use relative weighting. The early 1987 product added the ability to determine job standards and tie quantitative data to performance factors. The latest dos version 6.3, has served us well, it included many enhancements made in the time between 1989 and 1995. It was virtually flawless (bug free) and it was hard to fix something that was not broken, but there were some things we could do in the windows environment that could not be done in DOS. As far as the managers and employees were concerned, it was basically a manual system. The computer was used to set up the standards and values for each job and to score the evaluation form. PEP for Windows is both a computer-aided program and, if you wish, a full-fledged on line network computer program. Anything you could do with the original program you can do with PEP and much more! The Performance Evaluation Program is objective, inexpensive, easy to use, and operates quickly. Managers like the program because it eliminates tedious hours of writing lengthy statements. Employees like it because company job policies are addressed. Mutual, open discussions are made possible, productivity increases, turnover rates lower, and work environment improves as employee evaluations are handled in this simple manner. Manager-Employee relationships: Map working relationship between manager and employee using our drag and drop work screen. Make your own. Program prints employee information, factors and needs on pre-printed template forms. On Line. The program allows managers and employees to input their own evaluation on their own network computer. Flexible. Use any or all of the above options. Do it your way and change evaluation methods at your convenience. Many libraries are being compiled for specific occupations and industries. You can place any of your own jobs in the library for later reference. Use our generic set of standards and modify them to fit each job category. Job specific. Use your own to be even more precise. Describe the factor (175 characters) for each job category. Now use from 10 to 24 performance factors. Set the order of factors. When editing standards you can quickly search your library for other jobs with descriptions of that factor and choose the one that fits best. You can then modify the statements. You can set the minimum quantity for levels 2 through 5 . This feature allows tracking of any quantifiable factor (job knowledge, quality of work, appearance, attendance, or any other factor you can quantify.) The program will compare actual performance to your predetermined standards. Needs that are not being met in the work environment. With the custom form you can input your own words. Each job category can have up to 24 employee needs. Managers and employees in each job are involved in the weighting process. Double click a factors weight cell and go directly to the standards description screen to review or modify and then go back to weight screen with the click of the mouse. This allows setting weights and modifying standards simultaneously. Job category describing each factor, weight and wording for each level of performance. Job value graph for each job category. This helps the employee visually see a picture of their job. The job standards printout and the graph for job values is very much improved and takes about half the space of the DOS version. Many new printouts for each part of the program. Hard drive with at least 40 megabytes of free server disk space. Windows XP, Vista, Windows 7, Windows 8 Windows 10 . 16 Mbytes of RAM. 32 Mbytes recommended.